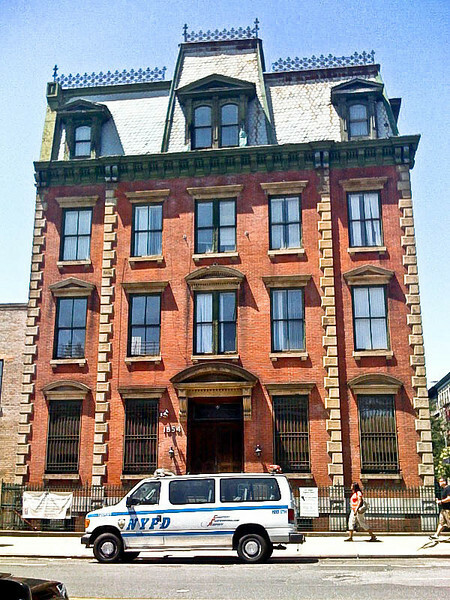 Built in 1871, the former 32nd Precinct Mounted Police Station house at the southwest corner of Amsterdam Avenue and 152nd Street is a holdout from the days when this area was best known as Carmansville (a name perpetuated by the public playground just across the avenue). The so-called “trans-Harlem” area of upper Manhattan was a country district where mounted police were a substantial part of the force. The old precinct house is built in the French Second Empire style, its mansard roof with iron cresting still conspicuous above the relatively low-scale streetscape. The building now belongs to a local church.